Set of six enclosed-gear, press-in bushing, split shaft Vintage Style guitar tuning keys for 6 String Guitars (right-handed). These are vintage style tuners and use the smaller peg hole (see approximate measurements below). If you have the standard/modern bigger hole, you’ll need to use vintage to modern conversion bushings for proper fit. 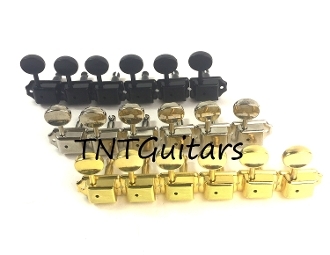 These six right side in line tuners use seven total set screws for enhanced stability.